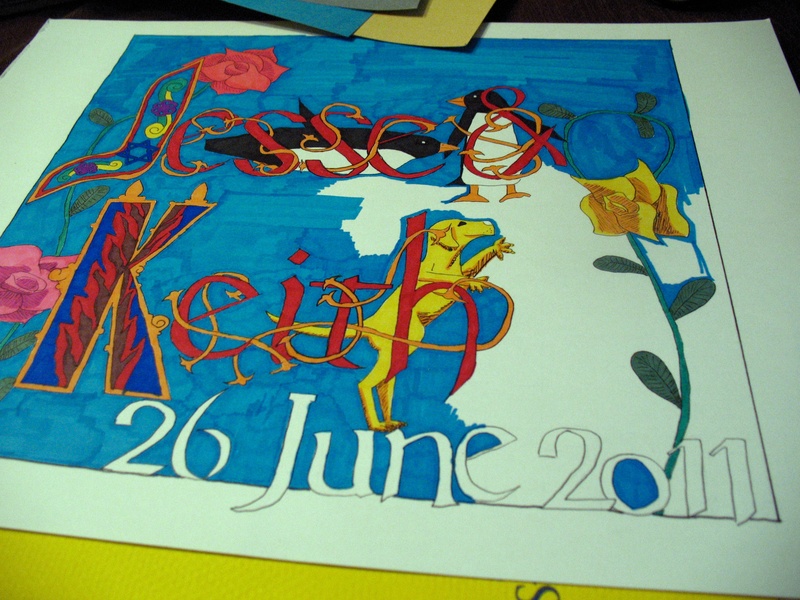 My cousin Jesse got married in June to a really great guy named Keith. Click any of the photos to embiggen them, by the way. Last year when Daniel and Clarie got married, I made a very fancy comic for them (this.) 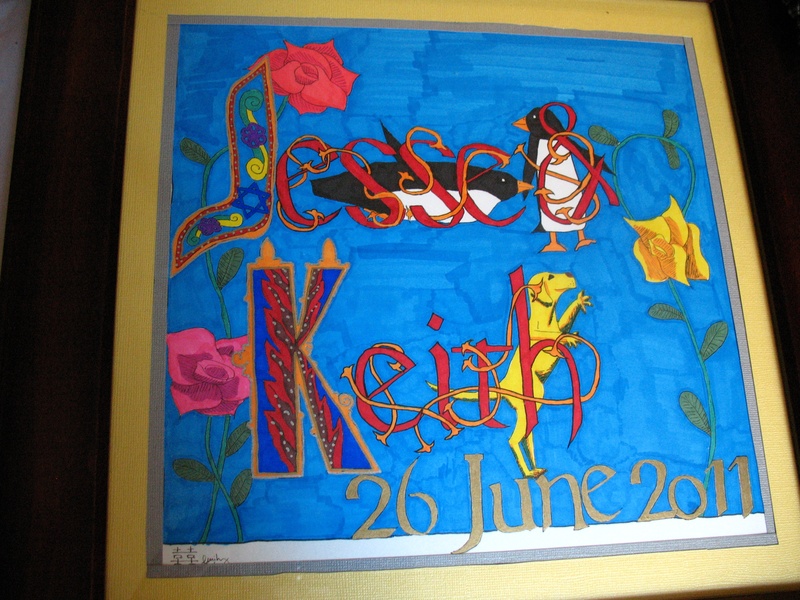 I knew I couldn’t let Jesse and Keith get married without doing something equally cool. BUT there was a problem. I was around for all of Daniel and Claire’s courtship, so I could recount it in comic form. 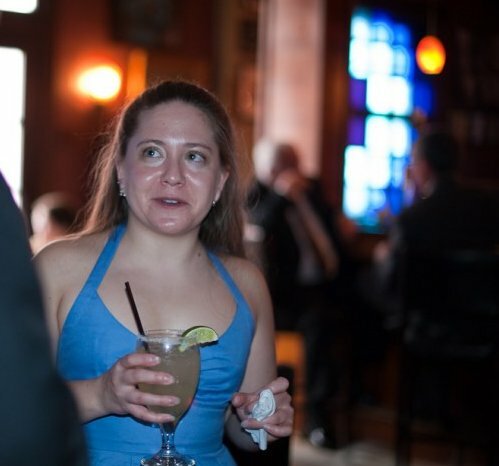 Jesse…was in Evanston, IL doing her doctoral work when she met Keith, and although I met him (through the magic of the internets) fairly early on, I wasn’t privy to the details of their life…and to call up and ask for some details would give the game away. So I had to come up with something else. 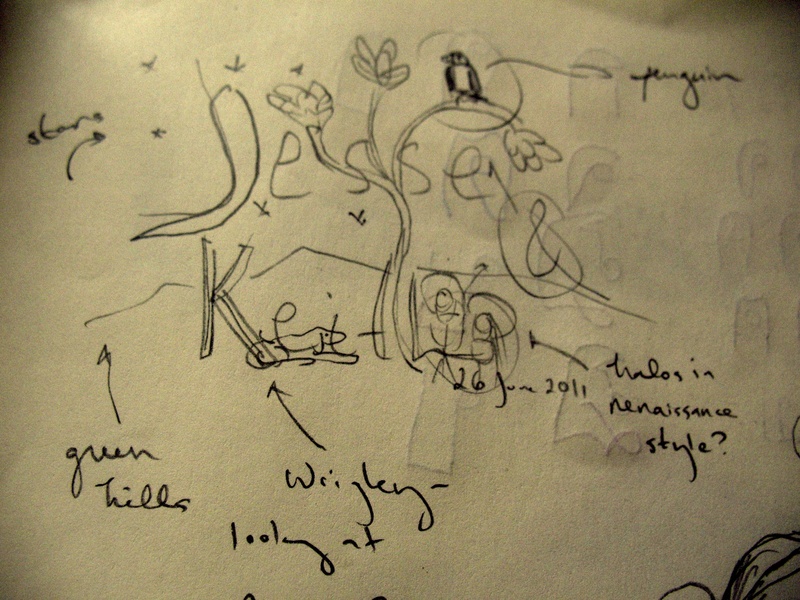 What I eventually did was an illumination. 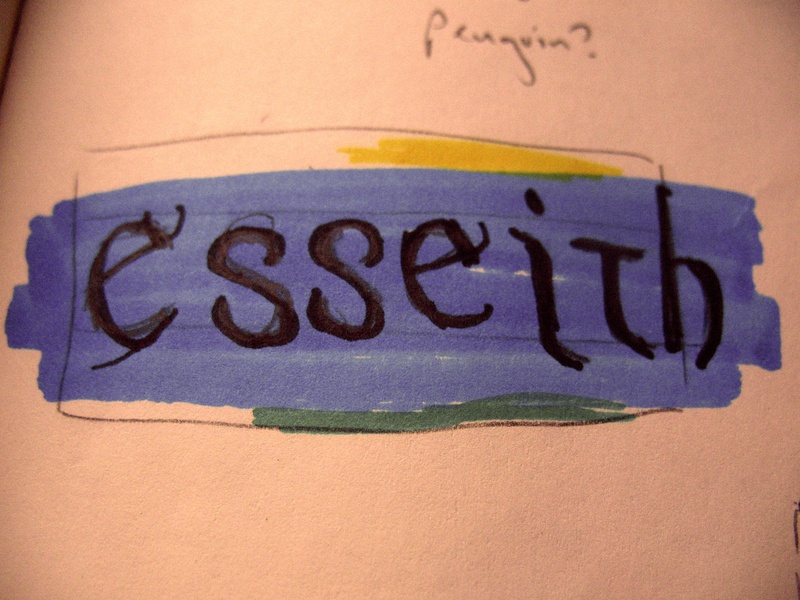 Jesse, see, is a medievalist, and Keith is…well, not a medievalist but he likes her. It made sense at the time. Go with it. Anyway, I wanted to take a moment to post some of the in-progress photos, since this project consumed most of May and June and overall I’m pretty happy with how it came out. I’ll offer a little commentary on how I came up with the design, just in case anyone is curious. On the left here we have my first sketch of the design. 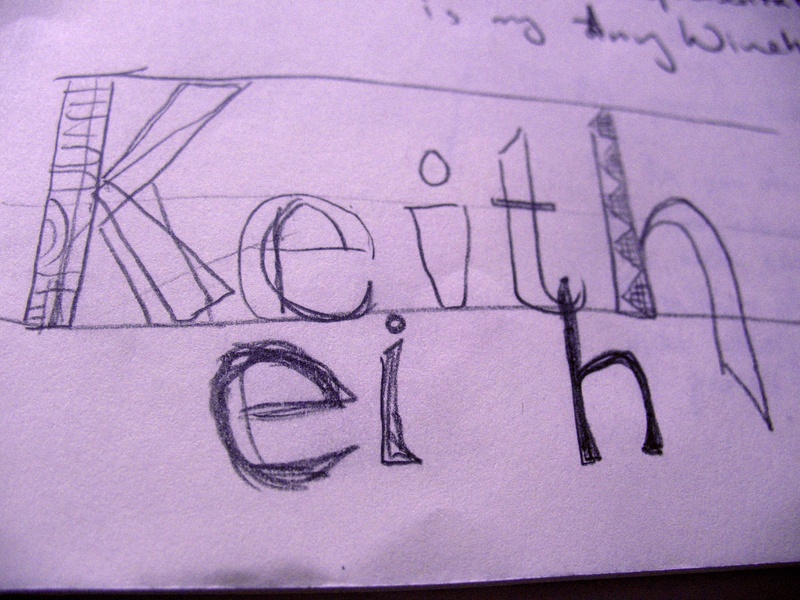 As you can see, I initially wanted to do Jesse’s name in a pseudo-Hebrew font and Keith’s name in a way that reflected his heritage somehow. On the right is a closeup of some early attempts at that. Above his name is the phrase, “A Musical Representation of Staggering is my Amy Winehouse Coverband.” So we can date this to the night we went to the Jonathan Coulton/Paul and Storm show at the Majestic, which I think was late April (around the 24th). 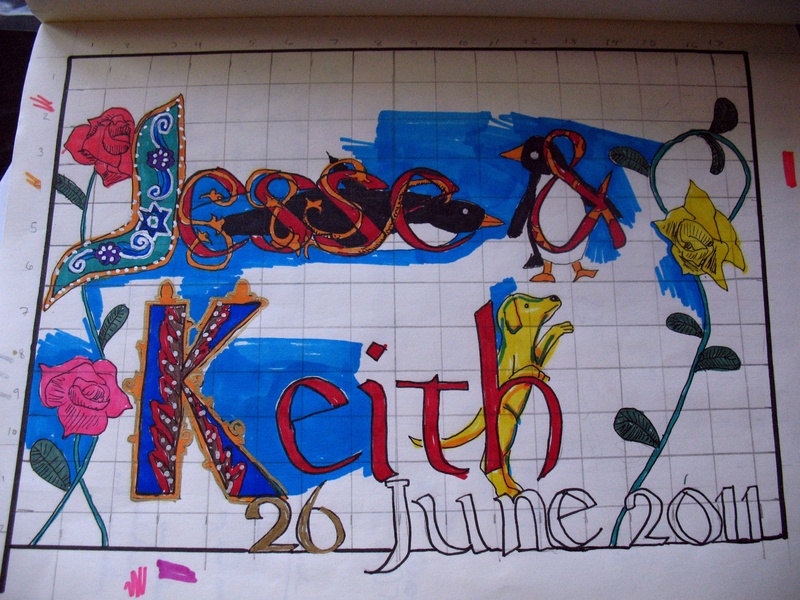 You might also note that this version of the picture had small portraits of both Jesse and Keith in it. 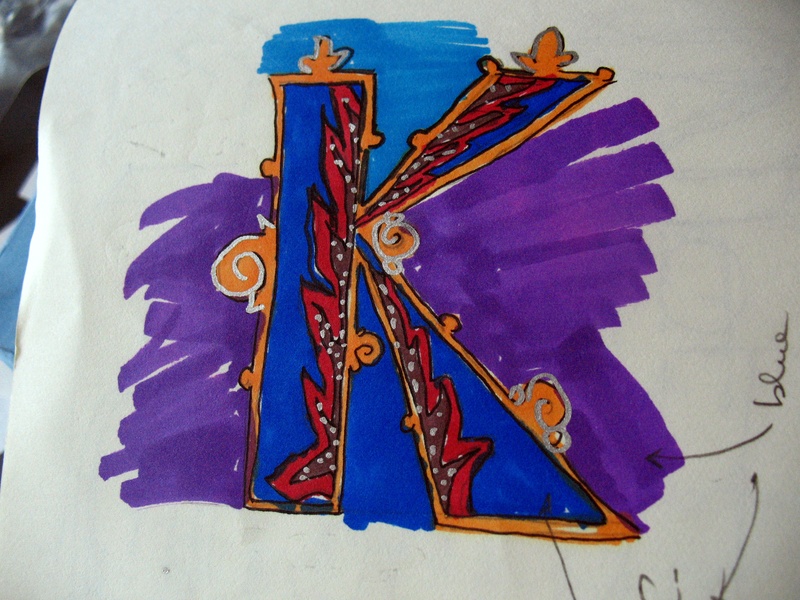 On the left, an early sketch of the J and the K initials. 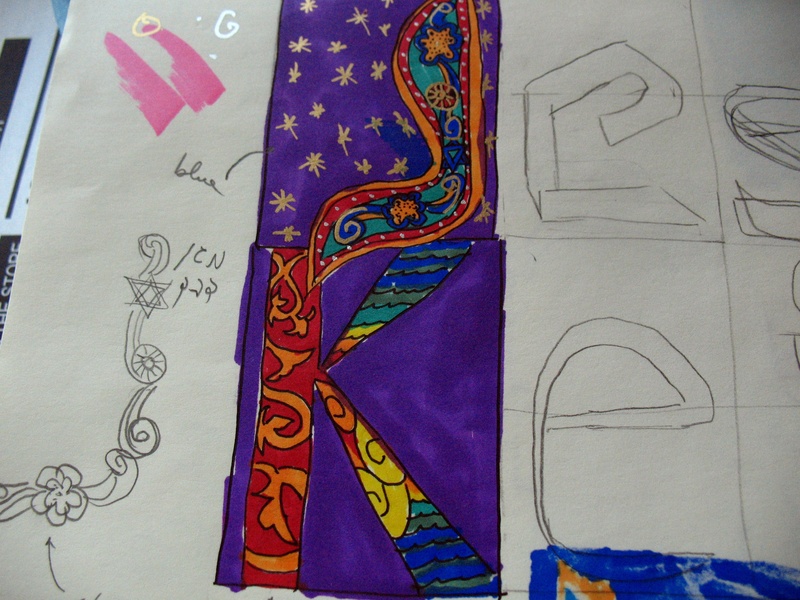 The design for the J was fairly easy; Jesse had listed an illuminated Haggadah on the registry (this one, in fact) so I just tried to make the J similar. 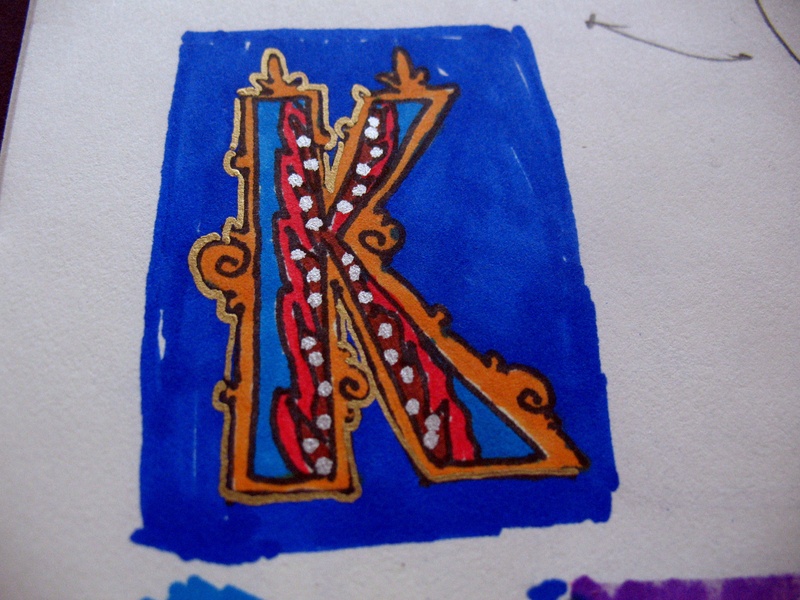 But what to do about the K? 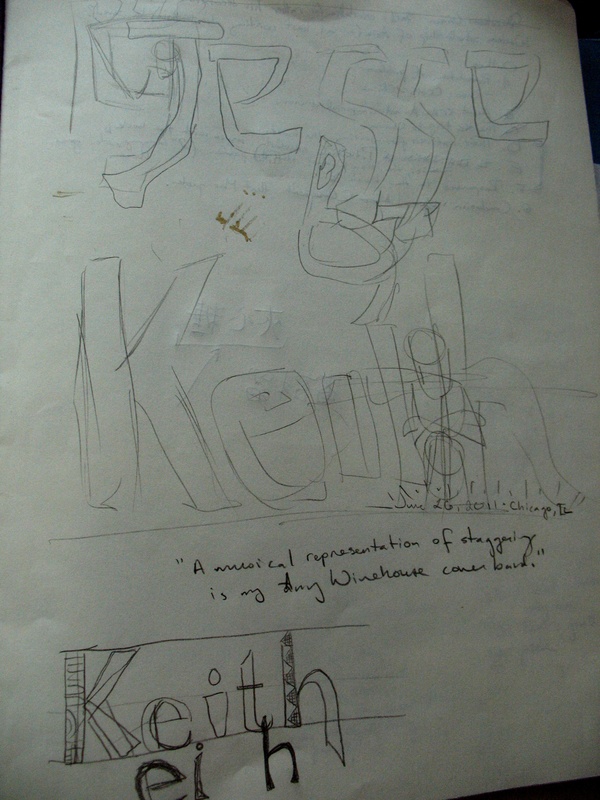 First I thought, well, Keith is African-American, I could do something using African patterns. But A) what part of Africa? It’s a huge country full of lots of different cultures. 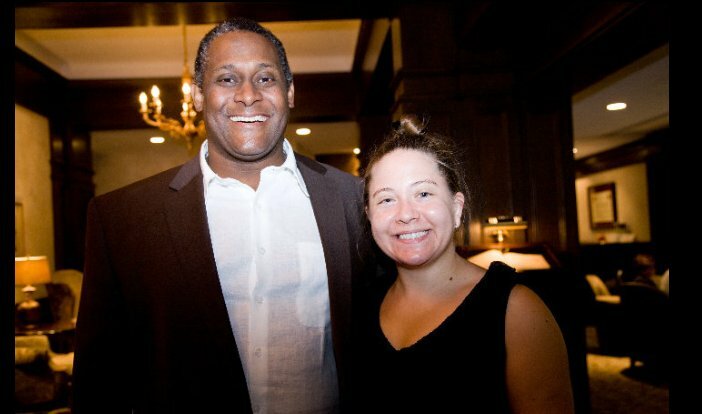 B) Anyway, he’s not African, he’s African-American. C) Also, isn’t that kind of weird, like othering or racializing or…I don’t know. Something. 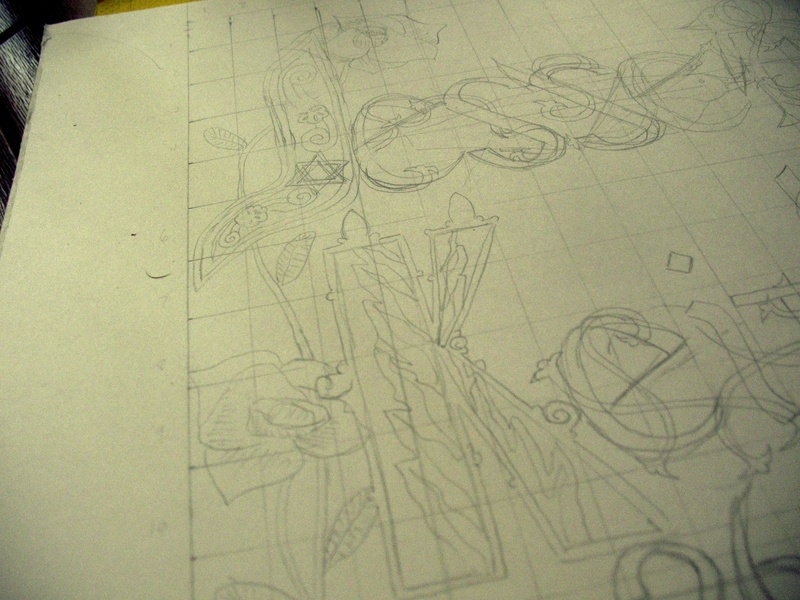 I started thinking at this point about traditional African-American art…which is mostly musical. First I thought, “Oh, the blues were invented by Picasso because he couldn’t afford other colors of paint.“* So that should be an easy solution, just make it blue. All kidding aside, I wasn’t entirely sure how to go from music to visual representation. And the main difference between me and a real artist is that I decided, instead of solving this problem, to change tracks. I made the Ks in the center and right. I put little finials on them in the style of the national wat in Vientiane (Laos) because Keith calls himself a “secular Buddhist” on his Facebook page. The first version of the Layout. On the left: some various small letters. I was trying to learn Caroline or Carolingian Minuscule. Since I’m not a monk, it took a lot of practice. 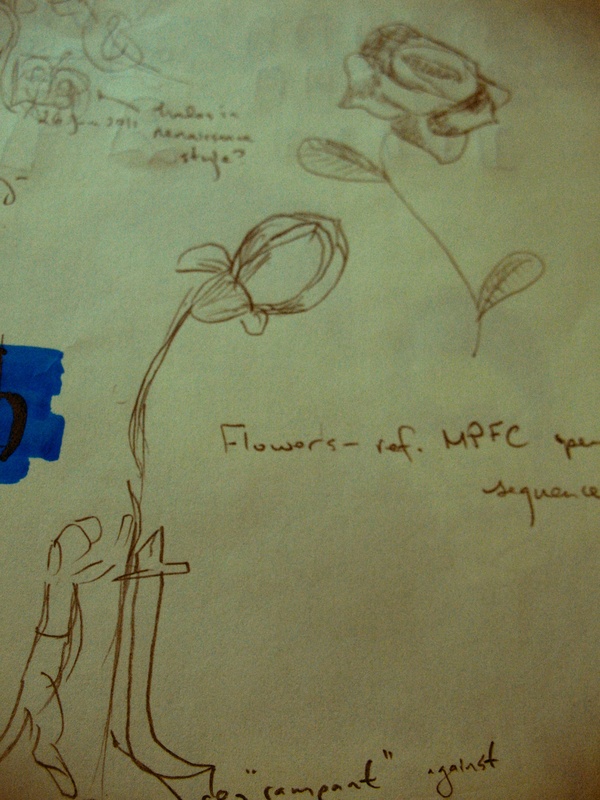 On the right, an early layout for the dog/flowers. Of course, when I put everything together, the layout had to change. 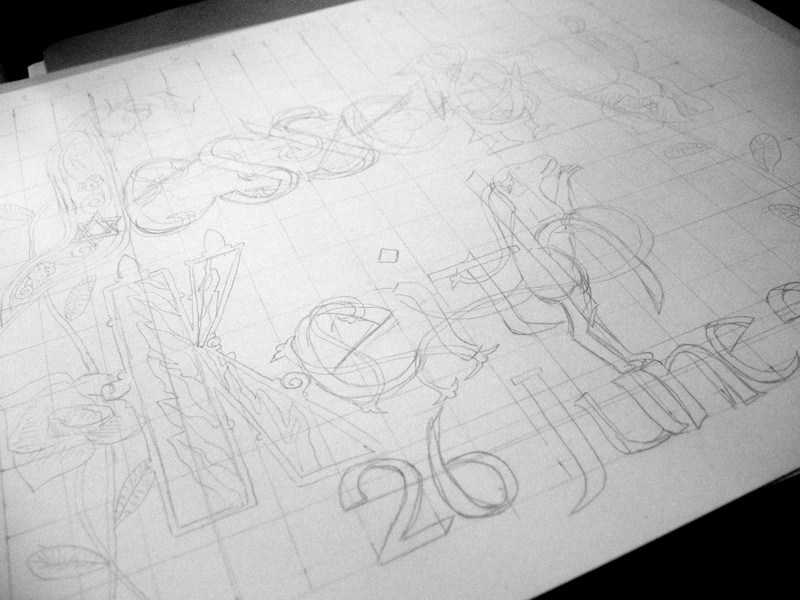 After I’d settled on a design, all that was left was sketching it, inking and coloring it, and then framing it. That’s not a terrific photo, but it’s the only one I have. And it did end up blue, but more because of the Scrovegni Cappella by Giotto (in Padua, Italy) that I toured with Jesse in 2002 or 2003. Thanks for coming along on this journey with me. I hope you found it interesting, at least. Now no one else get married for a couple of months, I need to finish my novel. * I’m super good at art history. I even own a blue guitar. True story. ** Swirly orange things taken from a Tibetan tapestry I found, I think. Because of the Buddhist thing.